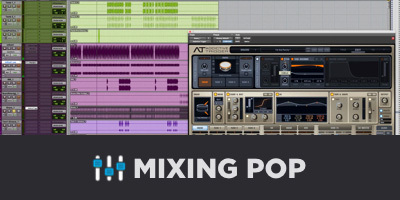 Different styles of music flex different muscles when it comes to producing and engineering. In order to really get in shape, you can’t just work on one set of muscles. Learning about music production and engineering is very similar. You may eventually decide to focus on a specific “area” of music production, but in the learning stages it’s important to take note of what lessons you can take from other styles. Even if you don’t continue to produce and mix EDM (for example), many of the principles can be used for the rest of your career. Engineering and producing Pop music is a little like creating a fantasy. Think Lord of the Rings as opposed to Man on a Wire. The soundscapes in Pop music are often larger than life and not super realistic. It can almost be thought of as escapism through audio production. If you consider it this way, it makes more sense the way the instruments are captured and treated. It’s not really about capturing an honest representation of the sounds. It’s more about creating an alternate universe. Vocal editing: It’s not uncommon for breaths to be removed from Pop vocals. It’s also common for vocal lines to overlap. Not the sort of thing that can be captured in a live take. It’s also typical for instruments and grooves to be fairly grid-based. Now, before you get judgmental, think about this … Sometimes, it’s fun to watch a movie like the Matrix, right? Sometimes, it’s also fun to hear music that’s the sonic version of visual effects. Old school Punk is a completely different view of music production and engineering. A big part of this style is capturing a raw statement. This often means a more lo-fi setup. You don’t need a fancy Neve 8048 console. You won’t need 12 mics on the drums. There won’t be a full day to get a snare drum sound. It’s set up and go. It’s likely the band will be loud. It’s also a very different approach to vocals. Punk vocals are often well suited for an SM58 or another dynamic mic. This is so the vocalist can move around and scream. There will be an exorcism in front of that mic. There is a different set of expectations for Punk. They want the message to be out front. They aren’t trying to create a world of escapism. They’re trying to give you a rude awaking. You’ll learn to forget about fancy production tricks. You’ll learn how to not overanalyze sound. There are two types of music that I’m going to discuss in the “documentary” category of music production: Blues and Jazz. Jazz is usually more polite in its presentation. There is very little trickery to producing and engineering jazz. The musicians are very refined and have great control as to what their instruments sound like. There is a lot of attention paid to capturing these sounds as accurately as possible. Not only in documenting the performance, but in the preservation of tone. You’ll learn a lot about keeping things clean and not leaning on compression. Often, jazz artists want the recordings to sound exactly how it sounded in the room. All natural, no filler. 100% Certified Organic. Where Jazz is classy, Blues is “brassy.” You know, like an inappropriate cousin. Blues is also about documenting a moment in time. But, the engineering and production are less refined. That’s part of the charm. By the time Chicago Blues started getting recorded, the electric guitar was a big part of the sound thanks to Muddy Waters. With this new sound came a new volume of playing. Through this, we can hear the bleed into other mics from loud guitars and drums. This created an interesting glue. Through old school Blues, you’ll appreciate the rawness of bleed and committing to a moment. Classical, like Jazz, is very much about the preservation of sound. But with Classical, we get into a bigger picture view of the instruments. It’s not about a singular sound, but a group of sounds. It’s not something we disassemble and piece back together. We learn the true power of acoustic environments. When recording an orchestra or quartet, the room is an extension of the instrument like no other. Hip-Hop is great because we learn how to throw out our over-analysis of sonic perfection. Hip-Hop has to drive. It doesn’t matter if it’s a little gritty. It has to have vibe and groove. That comes first. You’ll forget about your mic closet and compressor collection. You’ll start hitting gear beyond its acceptable limits. You’ll stop letting your eyes dictate sound and learn a lot about combining elements you wouldn’t expect to fit together. I’m just hitting the tip of the iceberg here. I didn’t even touch EDM, folk, country, metal and many other styles. The point is that you can pick up some powerful techniques associated with different styles. They can add depth to whatever field you specialize in. What kind of music do you mostly work on and what has it taught you?